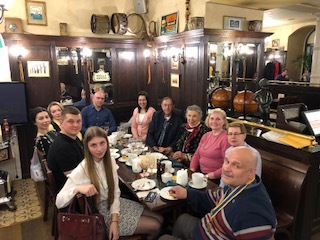 WPRC President-Elect Larry Myers is again teaching at the Lutheran seminary in Odessa, Ukraine, during the period of April 9-27. 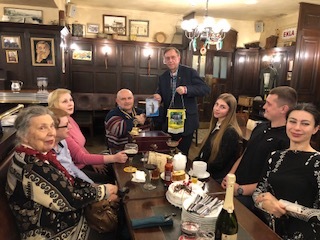 On Thursday evening, April 12, he again enjoyed an evening with the Rotary Club of Odessa - a small but energetic club full of compassion and service for the underprivileged. 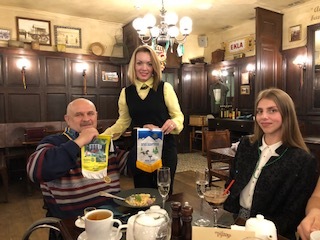 Flag exchange is a tradition among Rotary clubs worldwide. Three members of the Odessa club are officers in the Emergency Management office of Ukraine and were recently in Colorado for firefighter training. 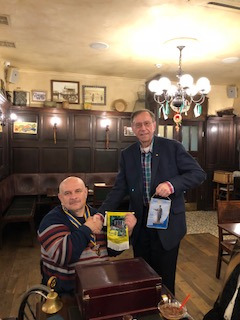 They visited with, and brought back a flag from, the Rotary Club of Parker, CO. P-E Myers likewise exchanged the flag of Whitnall Park Rotary Club.